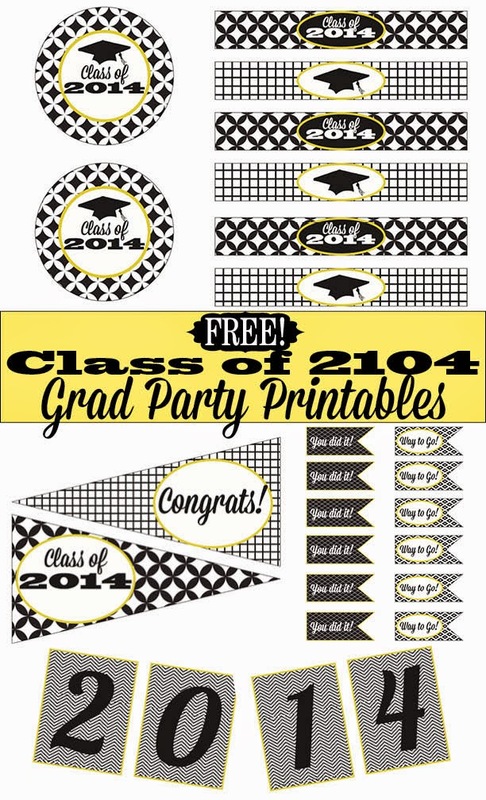 Free Graduation Party Printables for the Class of 2014! For those of you throwing a party for a special graduate in your life, I thought a few party printables might come in handy for the occasion! From water bottle labels, pennants, tiny flags, and more, you can download them by clicking here and here! We used the printables in floral arrangements, cupcakes, and more. The large circles are a great fit for the small Chinet clear plastic plates. We used a couple of dots of hot glue to stick the circles face-up to the bottom of the plates to get a custom look! I hope these help you out in throwing a great party! And congrats to the Class of 2014!!! Don’t forget!! There are only a few more days left to vote for your favorite finalist in the Update My Space Contest! Every time you vote, you’ll be entered to win a $100 Home Depot gift card! Click here fordetails! This entry was posted in Uncategorized and tagged Denise's Parties, Entertaining, Free Printables, Parties. Bookmark the permalink. Follow any comments here with the RSS feed for this post. Post a comment or leave a trackback: Trackback URL.